Here is a nice story showing the cutting edge science you can find in the the most everyday items. 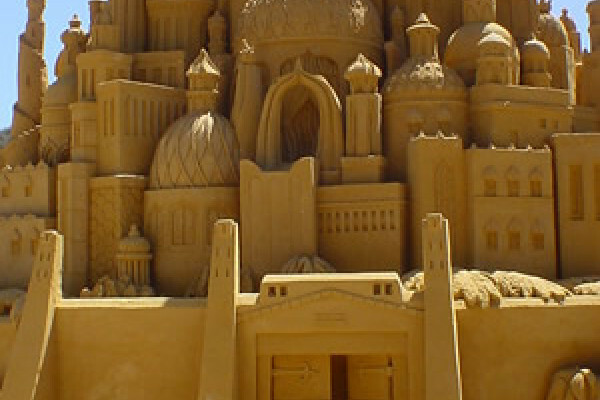 You have probably made lots of sand castles in your life, but have you ever wondered why it is so easy? It's not necessarily easy to make the fortification of your dreams, but it is very easy to make damp sand stick together, you don't have to mix sand with water in a specific recipe, it just seems to work. In fact if you mix between about 1% and 20% water by volume with your sand the strength of the mixture is almost constant. This is surprising because that is a huge change in the amount of water. You may not have asked this question but Mario Scheel in the Max Plank Institute in Gottigen, Germany did. Finding out the answer is quite difficult, because it is a three dimensional problem and sand is opaque so it is very hard to view what is going on. He and his colleagues managed to look inside a sand pile using X-ray microtomography. This is basically a miniature version of a CAT scanner you find in hospitals. It takes a series of X-ray images from different directions, and then uses a computer to put them together into a 3D model of what is going on. They took many 3D images of piles of sand with different amounts of water and measured the properties of the mixtures. The water seems to form little bridges between the sand grains, a bit like two trumpet bells glued to one another. The water's surface tension will then act to pull the two grains together giving the wet sand its strength. You would have thought that the more water you add the more bridges that form and so the stronger the sand and Mario found this was true up to about 1% water. Beyond this point bridges get close enough together that they start to merge forming bigger bridges and blobs of water. These blobs are weaker than the small bridges, so this cancels out the increase in water and leads to no change in strength. This may sound like just fascinating news for the under eights, but understanding how granular materials behave is very important in understanding soils, concrete and the stability of slopes, amongst many other things.